BRYANT PARK — Garbage cans in the shape of tulips are making trash look a little more attractive in Bryant Park these days. One hundred trash bins constructed of thin strips of bright green metal in the shape of petals have recently been installed across the park. 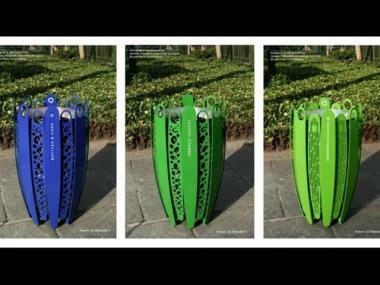 A supply of equally colorful and artfully sculpted recycling cans are on their way, and soon parks across the city will have the aesthetically pleasing receptacles. 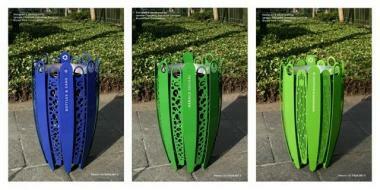 New trash bins for Bryant Park and Herald Square. 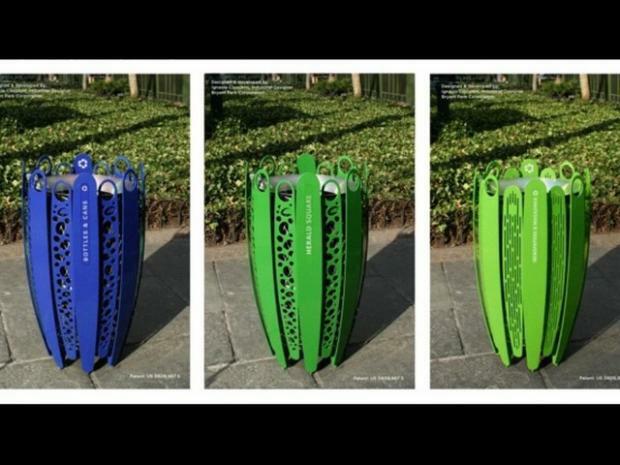 Ciocchini said he was inspired by the plants and flowers in the park and made the color of the bins “fern green” to match the greenery. Herald Square and adjacent Greeley Square will get the flower-shaped bins soon. The designs were finally determined by a public vote process in January. The hundred bins were installed in recent weeks to accommodate lunch traffic in the summer, which draws up to 5,000 people to the park in peak hours, the park said. Starting next week, Bryant Park will also receive a new set of 25 bins for recycling. Paper recycling cans will be in lime green and bins for bottles and cans will be a deep blue with circular cutouts. Both will retain the same overall flower-like shape.